The inspiration starts to find other more friendly materials to instruct and learn the braille system than paper and metal plaques, using and studying the braille system of six points or cells. 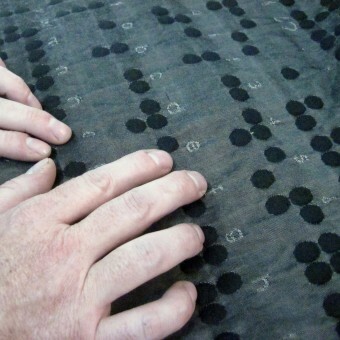 Industrial weave thought as a transalator for blinded people or visually impaired.This fabric can be read by people with good sight and it is intended for them to help blinded people or people that are starting to have vision problems to make a progress while learning at the same time. It is developed on greys because it applies the principle of no light perception. it contains alphabet, numbers, punction marks and more. The people with difficulty of sight learn the alphabet by touching the six points of the braille reading from left to right. The helper reads the letters and touches too the braille. The idea accomplished is that people with low resources that cannot acces to special attention in order to learn can have a piece of fabric on their own placea. 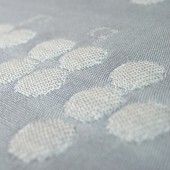 Fabrics are more frienfly to touch than paper or metal. This project started in November, 2010 and finished in april, 2011. It has been exhibited in Palacio de Bellas Artes, Mexico City, Central de Diseño, Matadero-Madrid, Zaragoza, Perú and Ecuador. 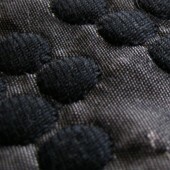 Polyester dyed in black and grey yarns woven in electronic jacquard looms. Sandwich special weave technique, satines and tafeta weaves. I made for months a research on weave techniques and yarns interaction in order to get the aproppiate volume in order to work for real not just for a prototype.I presented to a special organization for blinded people and they said it really work and people could read the points or cells in grey. Also it was easy for the interpreter to get close to braille language. It can be calisified as a non-commercial textile but it can be used on campaigns even woven with colors to support entities or organizations. The first test to do a textile was using just some techniques of yarns with different thickness. The result was weak so the project stopped untill I found a technique of weaves that uses three yarns on three layers. The most important layer is the last one, because it uses a very thick yarns which pushes the middle yarn. The principal yarn uses very opened weaves so it allows to make the volume visible and touchable. 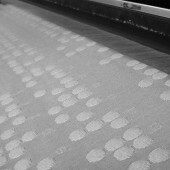 All the horizontal yarns had to be tors threads because without them the fabric could have hook problems with machines. Cristina Orozco Cuevas is a textile designer born in Mexico City on 1985. She studied the textile design career in Universidad Iberoamericana. She has been specialized on Jacquard and dobby patterns for about more than 5 years. She has about 800 original designs on the market, innovating on techniques and conceptualization of woven textiles on her country creating a “trademark” of author textiles. She has designed for several markets from very massive taste till exclusive ones. She is a pioneer on developing fabrics for children, creating unique stories and characters as an objection against global aesthetics. She has made designs for the hospitality, residential, furniture and fashion accessories market. She describes herself as a passionate fabrics fan. She defines her design process as a “wealth of conceptual information about to explote on the head and the need to create”. You just have to look at everything and textile it”. She has developed fabrics for mexican brands as ROCOCO and Nua Colección, for international brands she has worked with House of Mann. She also does some illustration, web concept and graphic design too as a need of her clients. She has been awarded in prestigious contests on her country as the Quorum (2008) and the Sixth Biennial of Design (INBA, 2011). Also she has won the Third Iberoamerican Biennal of Design in Matadero Madrid (2012). She has exhibited her work on Centres des Textiles Contemporains de Montreal in Canada, Palacio de Bellas Artes (Mexico) and Museo de Arte Popular (Mexico) Now she is working on Jacquard experimentation with techniques and yarns in order to take the best of craft and industrial processes. Textile Braille Educational-teaching, Tactile by Cristina Orozco Cuevas is a Nominee in Textile, Fabric, Textures, Patterns and Cloth Design Category. · Click here to register today inorder to be able to view the profile and other works by Cristina Orozco Cuevas when results are announced. Textile Braille Educational-teaching, Tactile by Cristina Orozco Cuevas is Winner in Textile, Fabric, Textures, Patterns and Cloth Design Category, 2013 - 2014. 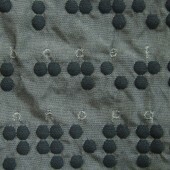 · Read the interview with designer Cristina Orozco Cuevas for design textile braille here. 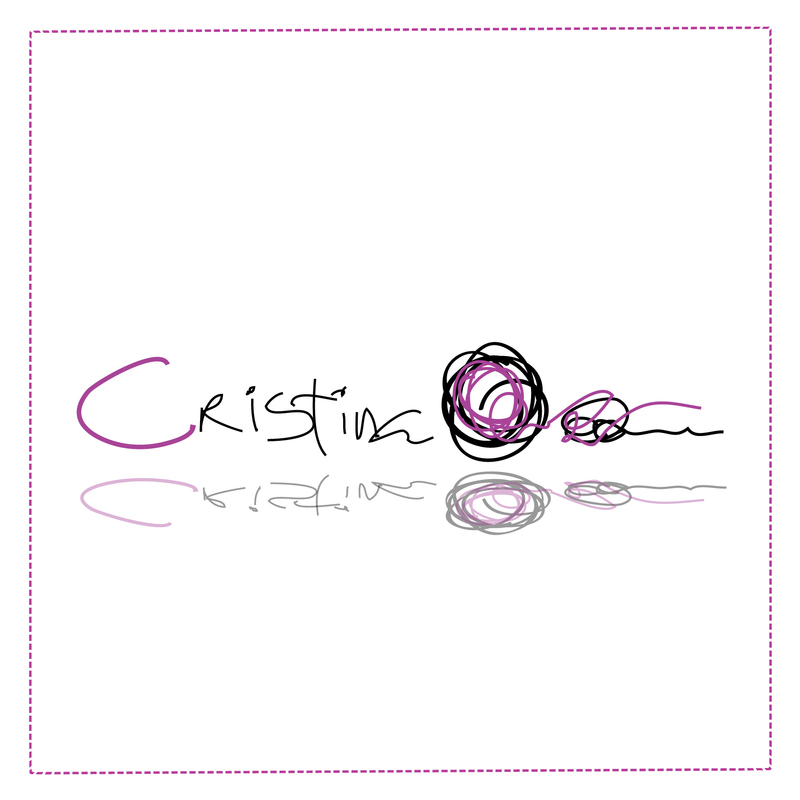 · Press Members: Login or Register to request an exclusive interview with Cristina Orozco Cuevas. · Click here to register inorder to view the profile and other works by Cristina Orozco Cuevas. Did you like Cristina Orozco Cuevas' Textile Design Design? Did you like Textile Braille Educational-teaching, Tactile? Help us create a global awareness for good textile design design worldwide. Show your support for Cristina Orozco Cuevas, the creator of great textile design design by gifting them a nomination ticket so that we could promote more of their great textile design designs.